Finally, I’m at my last photo post from our Hawaii trip! Browsers beware, it’s a very heavy post, so please don’t explode. In this post I will round up all the key places we visited around the island of Kauai. We saw our fill of beaches, natural wonders and waterfalls. Previously, I talked about where we ate, where we stayed and some activities in-between (a luau / sailing). Since we stayed on this side of the island, I’ll start with the awesome beaches it has. Going west from our resort, we headed to Tunnels Beach and Ke’e Beach at the end of the road. Both are beautiful, quiet and perfect to swim in. Ke’e is the best to snorkel at! Besides the beaches, we also stopped by the overlooks along the way in Hanalei Bay. Also, extremely close to our resort, this was the number one place I wanted to see before my trip. Since we went during the winter season, it was not suitable to swim in. Normally, its a natural swimming hole where you can snorkel, swim and see sea turtles. Despite the rain and high tides, I went anyways. The hike down was muddy and slippery, so if you decide to go for it, wear proper shoes. There is also a warning sign with the number of deaths occurred at the location. Scary stuff! Proceed with caution, because we did. The trail down was a little treacherous but the two waterfalls we saw, made up for it. When we finally made it down, the waves were crashing into the volcanic rocks violently, sometimes making it way up to us. It was exhilarating. Ahhhh! Is it going to reach me? After a long and twisty drive up, the view is just impeccable! The view on the road was just as magical. We did take on one of the trails down to the valley, and you better pack water! 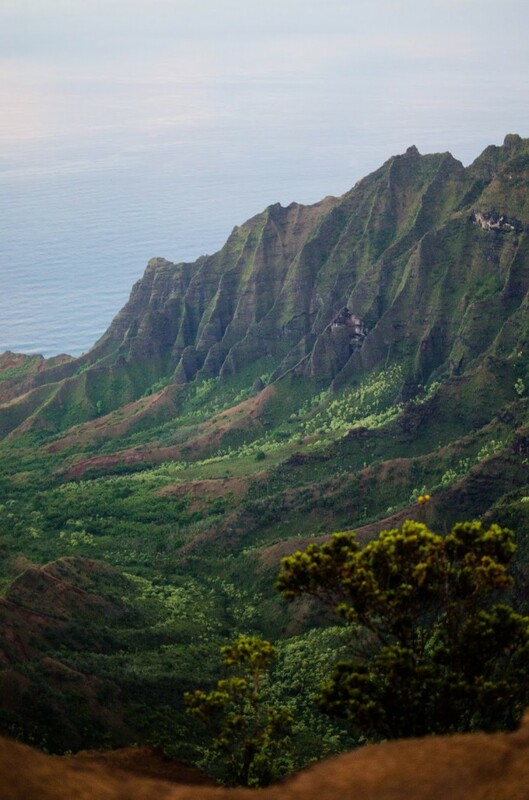 This is an absolute must visit when in Kauai. The view is breathtaking. The sunsets are gorgeous up this high. If you stay into the night, you can star gaze. This is nature’s beauty all the way. Just FYI, you better be a pretty good driver if you decide to stay until night fall. At this elevation, the fog and cloud covers all visibility down the narrow, windy road. We accidentally drove further North from Waimea Canyon into the park (instead back out to the highway). It was foggy! The roads as narrow and twisty. But we ended up parking and hiking out to see such amazing beauty. From here, we saw the lush Napali Coast and the most spectacular sunset. With a little time to kill, we decided to take the exit for this. It was the easiest waterfall we’ve seen, as we could park right by the overlook. Many other waterfalls required a hike from us to reap its beauty. In Lihue, this beach is part of the Marriot’s resort property but like all Hawaiian beaches, it’s open to the public. We decided to crash in to see the difference in beaches from the North and down East. I’ve yet to go to any of the beaches in Poipu (South). These photos are absolutely beautiful!